World Cup sponsor Adidas achieved 71% more tournament-related social media buzz than Nike despite a strong start from its non-sponsor rival, according to research from Adobe. Adobe, which dubbed the 2014 World Cup as the "most mobile sporting event ever", found that on average, World Cup sponsors experienced a 125% daily social buzz increase compared to pre-World Cup May daily averages. The findings come the day after Adidas and Nike both claimed real-time World Cup marketing success, with Adobe's research supporting their claims. Commenting on the findings, Adobe said: "At the beginning, Nike was seen as the clear victor, dominating social media channel feeds and stumping Adidas in terms of social buzz generation. 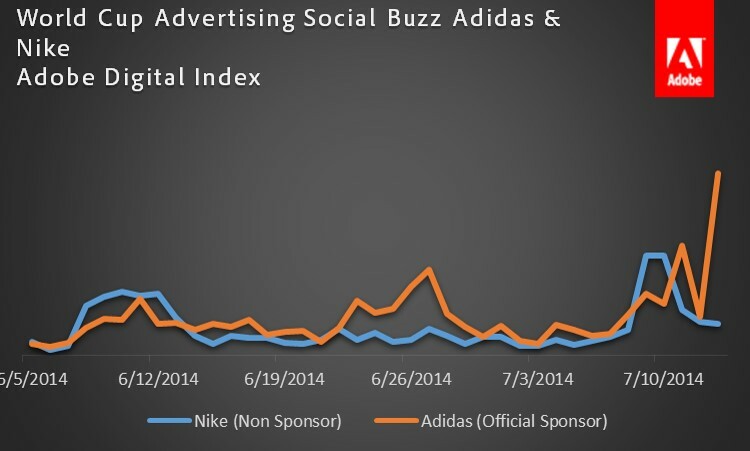 As time went on, new data from Adobe has found that Adidas now averages 71% more daily social buzz than Nike." Meanwhile, an analysis by the Adobe Digital Index (ADI) of rebroadcast online video found that 16% of video starts happened on mobile, with 7% on tablets. Unsurprisingly, the emotions of fans on social platforms swung from one extreme to the other: 41% of total buzz was centred on sadness or disgust, with 45% related to joy and admiration. Brazil’s 7-1 semi-final defeat at the hands of Germany led to 55% of Brazilian social mentions characterised by sadness, disgust, anger and surprise. 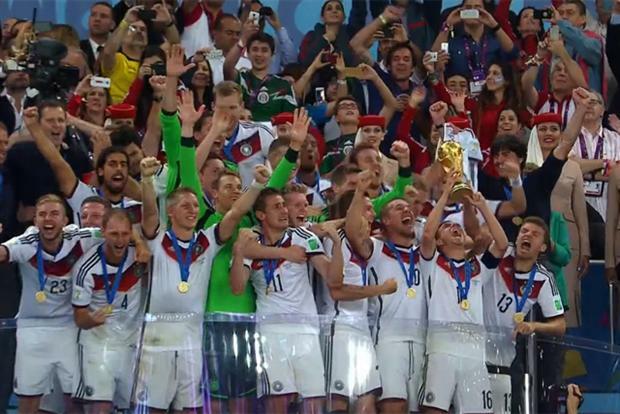 At the tournament's climax, Germany’s World Cup triumph took social media by storm. In the final, Mario Goetze’s winning goal gained him more than 1m mentions, while Germany and finalist Argentina together achieved 30m combined mentions. The 2014 World Cup was the "most mobile sporting event ever", Adobe said, with video viewing via mobile devices up 34% during the tournament. On peak days, nearly 25% of online video starts came from mobile devices, up from 18% pre-World Cup. Adobe data spans stats, online video viewing, social media buzz and World Cup sponsor activity. The company analysed data including more than 2.7bn online videos accessed via smartphones, tablets and gaming consoles, a well as 100m social media mentions using the term "World Cup" captured through Adobe Social in 36 languages. Data was captured from sources including blogs, YouTube, Facebook, Reddit, Twitter, Flickr, Instagram, Tumblr and Foursquare.